with painted eyes & a cloth body. 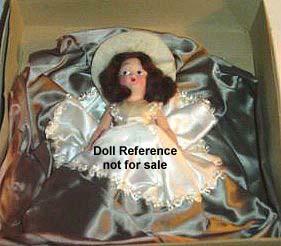 It is unknown if or how these dolls are marked. 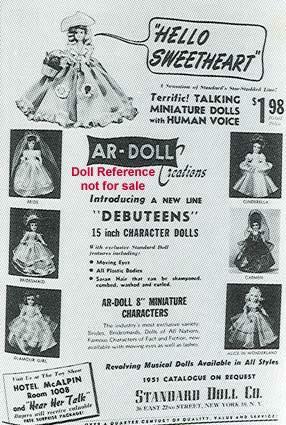 Standard is probably best known for their small Dress Me type dolls as shown below. 1951 Ar-Doll Creations Debuteen doll, 15" tall, character dolls, sleep eyes, saran rooted hair, talking doll series; Bride, Bridesmaid, Glamour Girl, Cinderella, Carmen, Alice in Wonderland, 1951 Standard Doll Company catalogue. Other Dress Me dolls; A & H Around the World dolls, Admiration Dolls of All Countries, Allison, Blue Bonnet Sue Storybook dolls mail in premium dolls, Carlson Indian dressed dolls, Commonwealth, Doll Bodies, Inc., Doll Craftin', Duchess Dolls, Elite Creations, Inc. Elite dolls, ENSCO dolls, Eugenia, Grant Plastics, Hollywood Dolls, LeeWards Dexter craft dolls, PMA Plastic Molded Arts Co, Reliable Toy Co, Royal (called Tiny Teen), Sears, Souvenir dolls, Spiegel, Virga Dolls, Wards, Woolco Woolworths and many others.